Erected in 1919, the monument honors the boll weevil, a pest which destroys cotton crops and was once the scourge of Southern, Mexican and South American, agriculture. However, as always, disaster can lead to unexpected opportunities. Farmers of Enterprise, Alabama, long dependent on cotton, took the weevil’s arrival as a motivation to diversify their crops. This led to the discovery that new crops (such as peanuts) could be grown on the same land, which brought new money to the area, and the evolution of more modern agricultural practices. 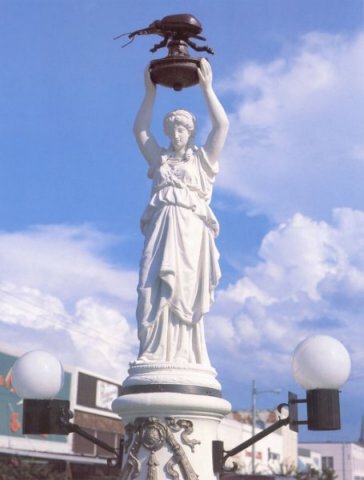 The Boll Weevil Monument is thought to be the only monument in the world erected to honor an agricultural pest. In 1998, the original statue was severely damaged by vandals. It was removed to the nearby Depot Museum, and a replica erected in its place. The monument is in the middle of the intersection of College Street and Main Street in Enterprise. The damaged original statue is on display at the Depot Museum, at 106 Railroad Street. Dothan, Alabama has been invaded by scores of anthropomorphic peanuts. The highest point in Florida is still the lowest high point in the country.